You make Recycled Reads sustainable! Recycled Reads receives all of Austin Public Library's discarded material, as well as donations from the public. We sell, recycle or repurpose this material, and all our proceeds benefit the Austin Public Library. Volunteer for the bookstore or get more information about volunteering for the Austin Public Library. Recycled Reads accepts donations during business hours up to 30 minutes before closing. The bookstore accepts anything printed or recorded, except magazines as well as e-readers and tablets. For security reasons, we cannot accept donations outside of days or times listed above, and we are not allowed to touch items left outside of our door. Small donations (two bags/small boxes) may also be taken to any of the Austin Public Library branches. Check out the Recycled ReadseBay online storefront, open 24/7 and featuring collectibles and unique items. Check out the Recycled Reads Alibris and online storefronts, open 24/7 and featuring collectibles and hard-to-find books. Searching for something specific? Send us an email at recycled.reads@austintexas.gov or give us a call during business hours. 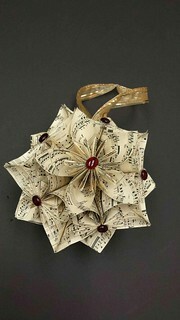 Some of our upcycled creations using old sheet music, maps, and other repurposed material.